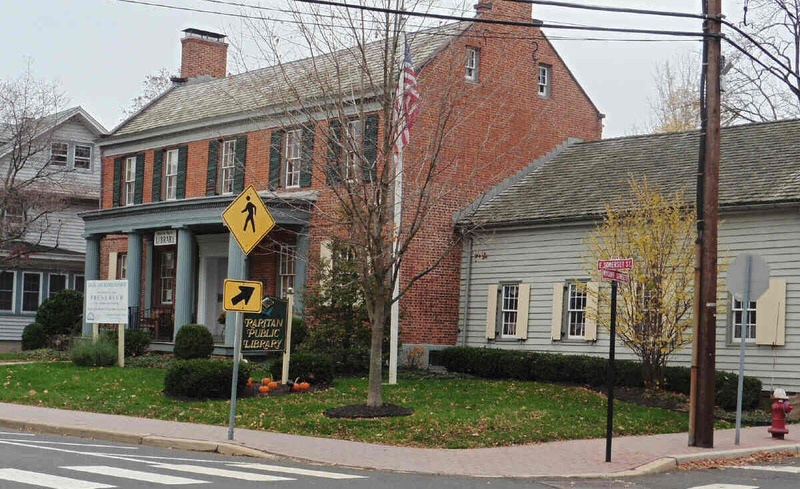 The Raritan Library has occupied the Historic Frelinghuysen Mansion for over forty years. The atmosphere and charm of this fully restored building could give the impression that the library has always been there. 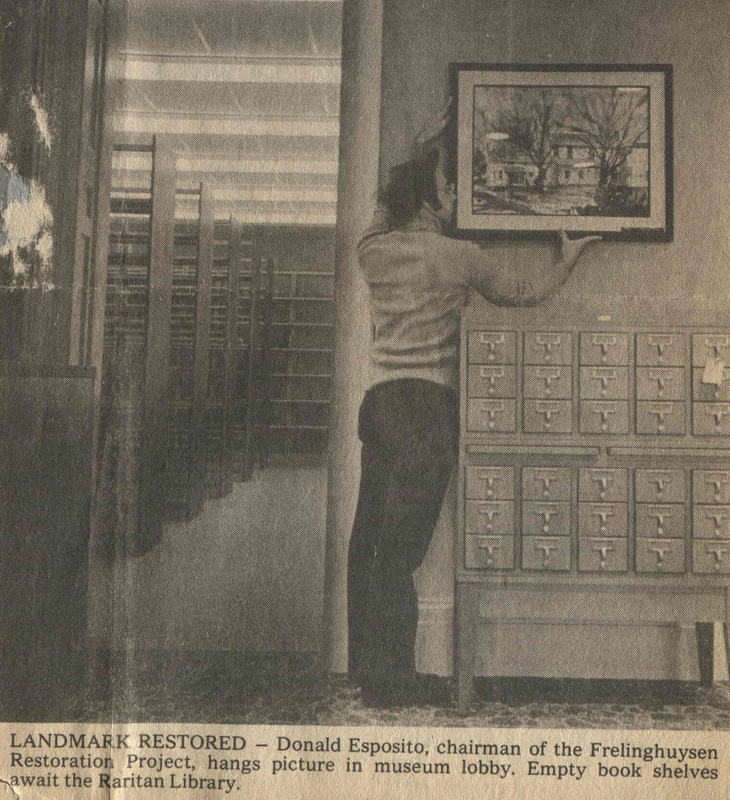 But back in 1968 the library was elsewhere - cramped into a small space at the old firehouse – and the Frelinghuysen Mansion looked like it was ready to fall down. 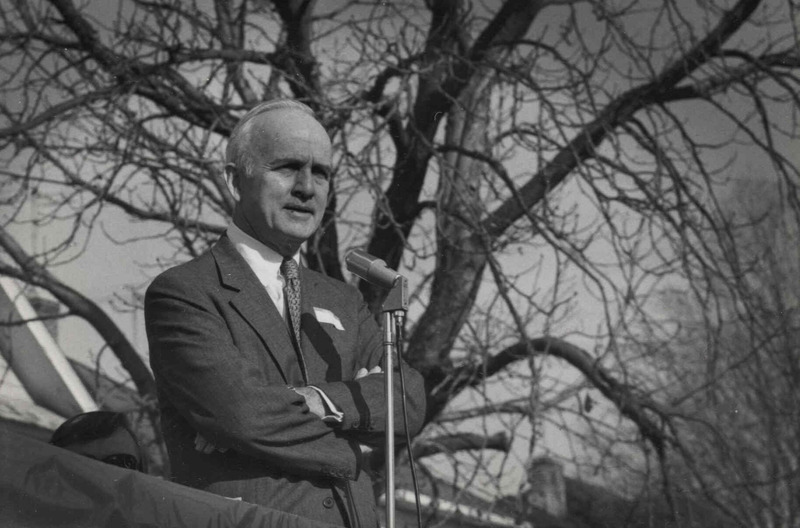 A chance encounter in 1968 between the town historian Don Esposito and Congressman Peter Frelinghuysen set changes in motion. 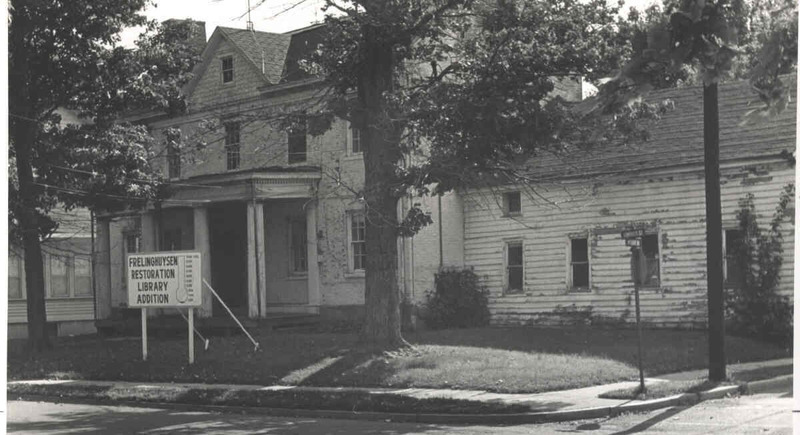 The Frelinghuysen Mansion as it was in 1970. In its pre-library days. Note the steel poles holding up the front facade. For decades Raritan had struggled to find an adequate location for a public library. The earliest library was a section in the firehouse in the 1890s, but this did not last long. In the 1930s Stella Navatto turned the front porch of her home at 4 Somerset Street into a library of around 75 books that the County provided. That library would move into various locations on Somerset Street. But it was always cramped into a section of an existing store such as a pharmacy or grocery store. Several locations were tried, but without the proper space, funding for books, or a staff, by 1940 the makeshift library folded. 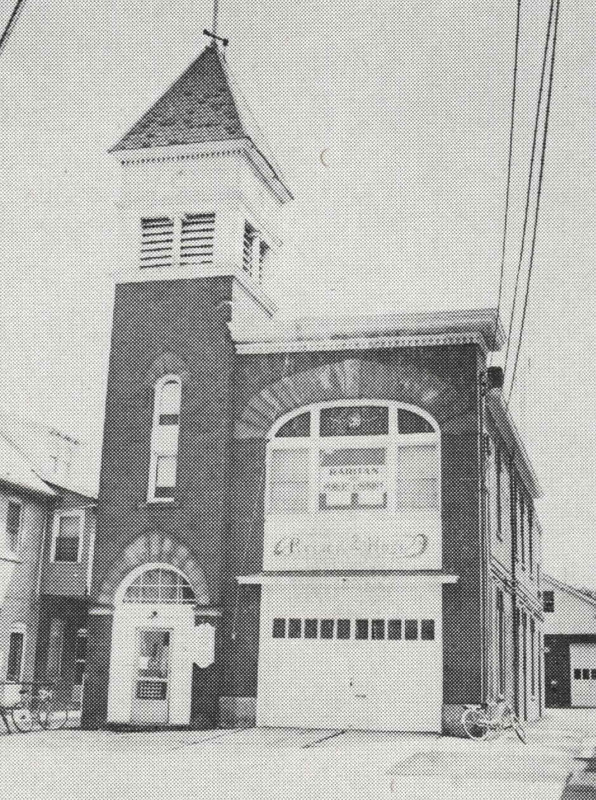 The library was revived in 1961 opening on the second story of the old firehouse on Anderson Street. But again the space allocated was too small and the steps proved troublesome for some senior citizens. on the 2nd floor of the old firehouse. 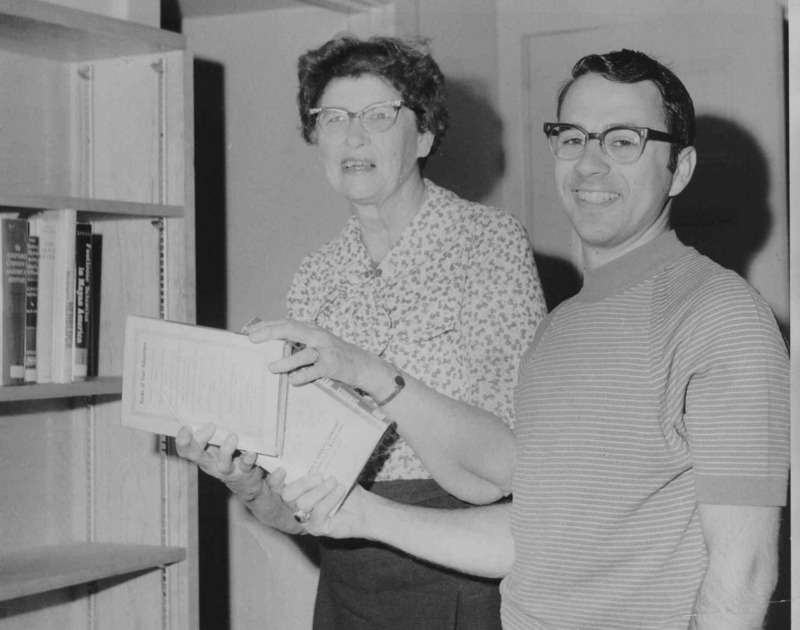 In 1968 Don Esposito was a member of the library board. 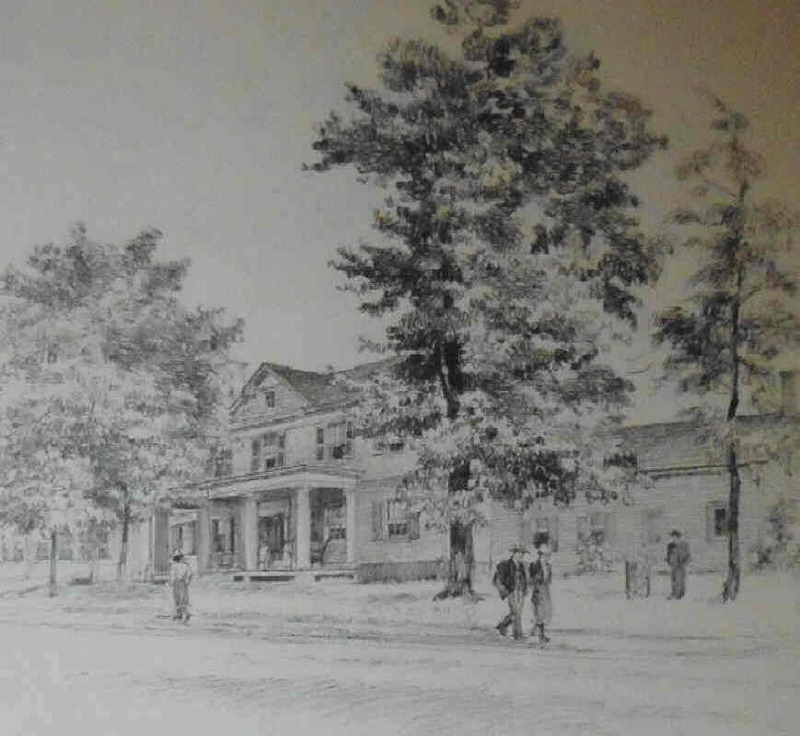 That year a Centennial Celebration was held marking Raritan’s 100th Anniversary as a town. About 20 minutes before the event started Don Esposito was seated next to Congressman Peter Frelinghuysen. The congressman told Don that he needed to get out quickly after the event – was there a way that he could get his car parked closer to the grandstand. Don offered his nearby driveway on Reimer Street to Peter Frelinghuysen. They walked out toward the car and along the way they passed the old Frelinghuysen Mansion. It was in terrible condition. Don could not help but telling the congressman what a shame it was for a historic house to need such repair. (The building’s only purpose at the time was that it served as a two unit apartment.) He went on to suggest that perhaps the building could be restored and converted to a library. 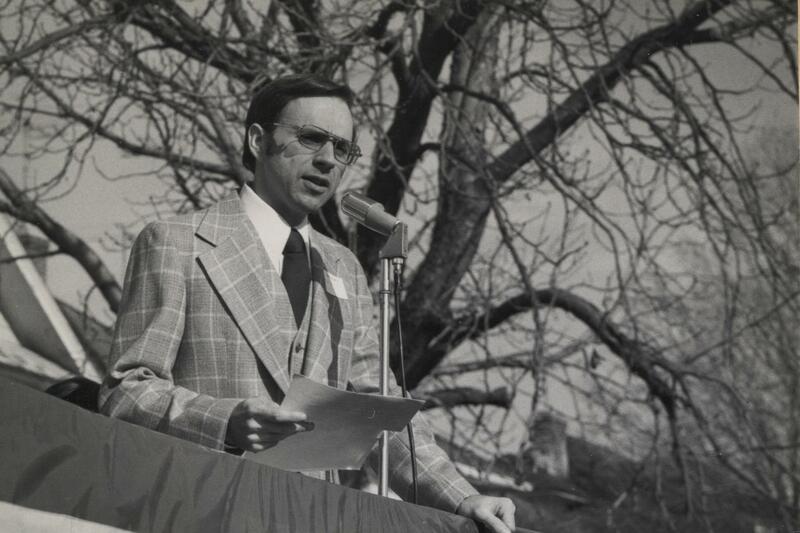 Don Esposito back in 1970. It must have difficult, perhaps embarrassing, for Congressman Frelinghuysen, whose ancestors had once owned the building, to see the old Frelinghuysen Home in such bad shape. (In 1968 the home was owned by the Glaser Family who had purchased it from the Frelinghuysens in 1924.) Peter Frelinghuysen did not need much convincing that this home should be saved and used for the public good. He contacted the owners and purchased the property. 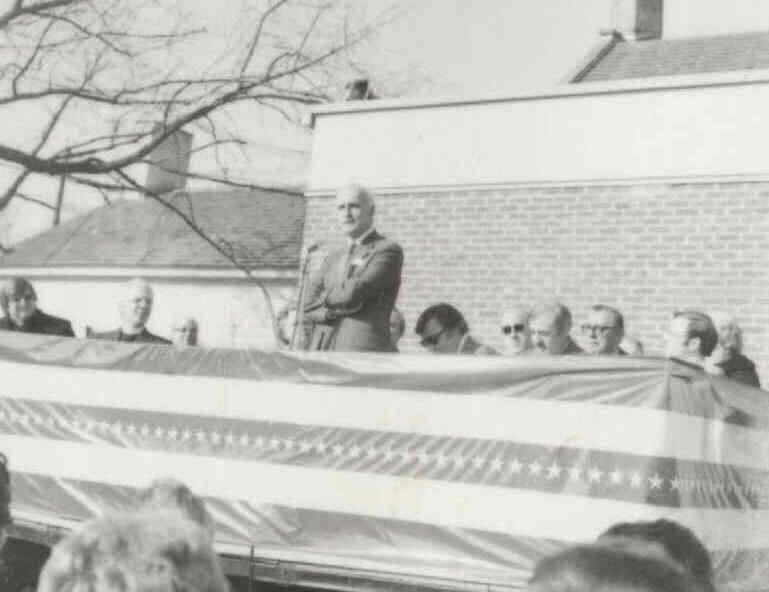 He then donated the home along with $66,000 for restorations to the town of Raritan. The Frelinghuysen Mansion dates back to the 1700s. The first floor of the main brick section was probably built around 1740-80 as the architectural design dates it to that era. The western wooden wing (now the children’s room), was probably built earlier than the brick structure. However, that wooden wing was most likely moved from another nearby location to its present location after the brick structure was built. Around 1810 a second story was added to the main brick section of the building. Around 1850 the facade with the wooden columns was added to the front. This letter started it all. Starting 1970 the town set out to restore the building. Raritan, making a wise choice, assigned Don Esposito to be the Chairman of the Restoration Committee. They also secured the services of renowned architect John Dickey whose impressive resume included work on Philadelphia’s Independence Hall. The restoration project endured many challenges, but they overcame them all. The Ground Breaking Ceremony for Restoration. The wooden columns were rotted – The home had 4 wooden columns (barely) supporting the façade in the front. It was found that the two outside wooden columns were rotted so badly that they would have to be replaced. To add two new columns to match the finely crafted “24 sided” original columns would take the precision of a fine craftsman. But the replacement columns were carved so well that today no one can notice the difference. The brick had been painted - The entire brick exterior had been painted white. In 1970 there was no known paint remover that could take off such a coat of paint without damaging the brick. So a special paint remover was created just for that task. This drawing was done in the 1930s. More funding was needed - Another major challenge was money. The Frelinghuysens had given $66,000 for restorations. A great start, but more money needed to be raised. Here Raritan showed why it is called “historic and patriotic” as everyone came together. Don Esposito and the rest of the town went into high gear holding many fundraisers. 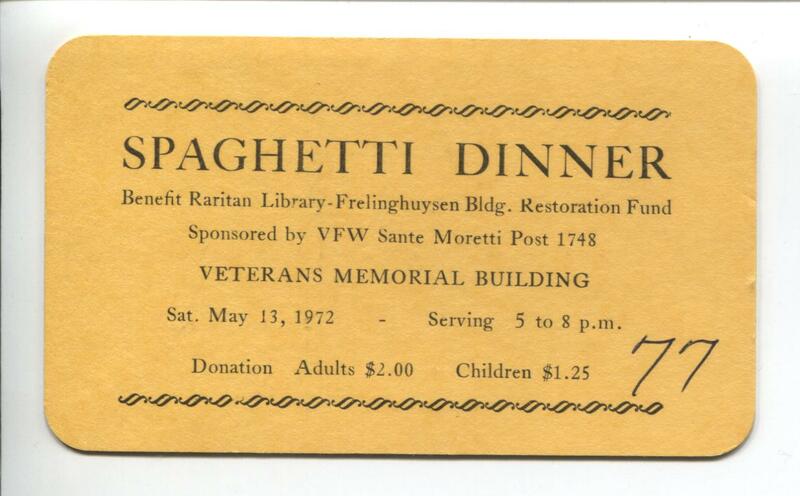 Movies were held, there was a spaghetti dinner, and a town garage sale. Even Don Esposito’s former fourth grade teacher had her class solicit funds. They then donated the $14 they raised. Murphy’s Law - So often anything that can go wrong, will go wrong. Mid renovations there was a carpenter’s strike which held things up. During the strike Don Esposito himself hammered in a few nails for the work that could not wait. Another problem occurred when Don mailed a large package that he spent months putting together to obtain a five figure HUD Grant. Despite sending it “certified mail” the package got lost in the mail. Fortunately he had made copies of everything and hand delivered the “replacement” package. It took over four years for the restoration to be completed. 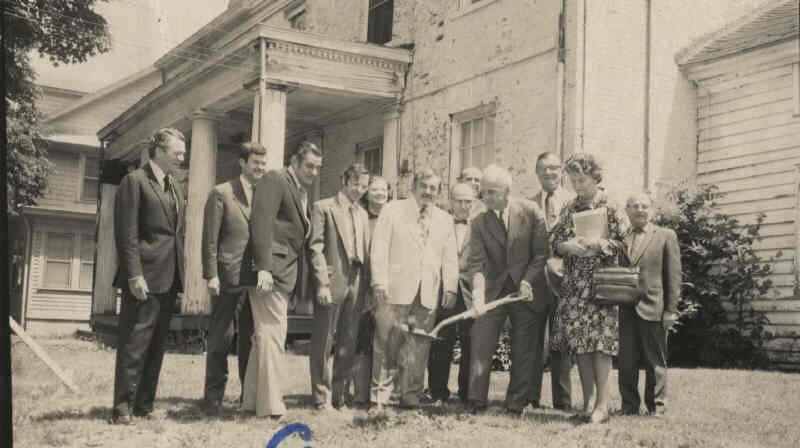 In December of 1974 the Raritan Library at the Historic Frelinghuysen Mansion opened to the public. Raritan finally had a location big enough for a library. And this was not just any location, but a beautifully restored historical home. 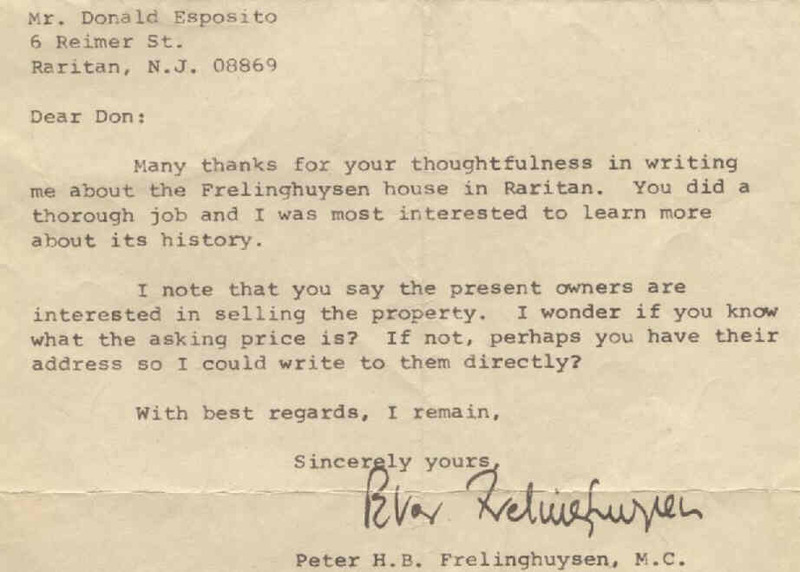 Early next year the Raritan Library is honored that Don Esposito will return to give a talk on the story of the restoration and the history of the Frelinghuysen home. Contact the library for dates and times. click to see more dedication photos.